Gantt charts are there to make resource management simple. They are there to make the plans easy to comprehend. They are the visual addition to dates, assignments, and projects. What if you have a lot of complex data that should be visualized. Are Gantt charts still it for you? Yes, with a little help from custom data fields. What are the custom data fields? Custom data fields are the data fields that can be customized. That’s helpful, ain’t it?! Well, in Ganttic, you can add custom data fields to resources, projects, and tasks. Imagine that you are using a Gantt chart Excel template. You are going to color some cells to book resources. You use the colored area to write down the status of the task, the project manager, and the project reference number. You should also add a link to relevant documentation. And you would like to leave a note regarding the task to another project manager. It just won’t fit. However, you were going to send the spreadsheet as an email attachment anyway. You can just add the link and the comment to the email. Now imagine that you are using drag and drop scheduling to create a simple Gantt chart. You are choosing options from drop-down menus, adding the reference number and the note. Then you click save. Sounds a lot better, huh? 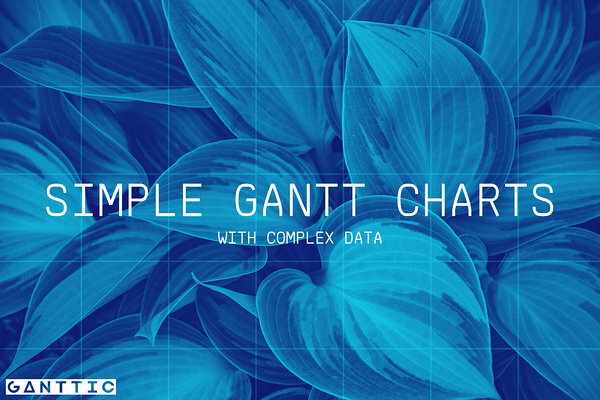 With Ganttic, you can create a simple Gantt chart with complex data. No spreadsheets. No emails. No missing information. It says Ganttic Update in the title. There have always been custom data fields in Ganttic. Yes, we did something. Let’s keep it short. They have a new look and feel. Adding custom data fields to resources, projects, and tasks has never been easier and more clear. What to use custom data fields for? Custom data fields are there to carry all sorts of information that you have. Information about your resources, projects, and tasks. Information that you can not add to a Gantt chart Excel template. Information that should be communicated using another method if there wasn’t a Gantt chart creator that enables adding it. Although you can add the same type of custom data fields to tasks, resources, and projects, the use cases can be somewhat different. As we described earlier, you can add all sorts of additional data to a simple Gantt chart using custom data fields. The status, the project manager, the… Whatever you need. The information you have added can be filtered out and it can be used for coloring as it is with projects. In Ganttic, resources can be anything from people to equipment. Let’s say you have a piece of equipment that can be booked by different project managers. The specific piece of equipment that we are talking about is located in Dallas. You have other similar pieces of equipment, so every single one of them has a reference number. Since you want to keep track of the equipment, and you want the project managers to know this stuff, you can add both of those things - location and reference number - as a custom data field. Once a project manager clicks on the resource, they’ll know that it’s the piece of equipment in Dallas with the reference number 35750. Rather than booking that one, they’ll book then one in New York with the reference number 45750, since it’s closer. All the data is there, out in the open. The manager can use it and allocate resources. Resource custom data fields are most often used for identifying. If you are staffing projects, you can add the location where the resource is based, and the location. You can add their competence (skills), position, and hourly rates. You can use the information you have added to group resources, filter them, and create all sorts of views. Views of resource allocation at a location, in a department. You can filter out a type of equipment and save what you see as a view. You see where we are going, but if you really want to learn all about planning resources for projects using views, we covered it in another article. In addition to that, you can also use resource custom data fields for calculations using reports. You can make reports calculate how much to pay to a specialist etc. Project custom data fields come in handy if you are working with some other management tools alongside Ganttic. Let’s say the sales team just submitted a proposal for a project. It’s in the system. You need to check resource availability. You add the project, copy the project reference number, choose the location and the department from the drop-down menu. You choose proposal for the project status and choose yourself as the project manager that’s in control of the project. Other managers will instantaneously see if you start dragging and dropping Gantt charts to book resources for the project. This story really can be told without Excel spreadsheets and email threads. Project custom data fields, namely date type project custom fields, are where to go if you need to add milestones to your projects. Just make sure the ‘Show as milestone’ button says ‘ON’, and the dates you choose for each project will be displayed as milestones on the Gantt chart area. If you are using sync to marry Google Calendar and Gantt charts, you can sync the location of the event through link type custom data fields. And that’s not all! Remember when you chose the project status from the drop-down menu? You can assign a color to every status on the list, and you can use those colors to get a quick overview of your project statuses’.